Akumu is the one-man project, run by Deane Hughes, who also worked with Rik MacLean in the collaborative project Kalte, already reviewed here. Akumu, translated from Japan as “nightmare”, is again concentrated on longform drone landscapes, and listening to his album “Descent”, released on No Type/Panospia label, you are sure to see, that singly musicians of Kalte are making music of the same magnificence. The album consists of four tracks, three of them representing the triptych of “Hive”, and the last, called “Descent”. The first feature, I came across, studying Akumu’s material, is the fractured sonic picture, with warm crackles and dense and solid layers. It should be noted, that all the music is based on field recordings, made within train stations, banks, buildings, and they are synthetically processed, giving rise to remarkably strange ambient textures. It is not noise ambient, there are no harsh attacks, just on the contrary, it is pleasant to listen to all the tracks; it is some kind of soft, gently noise. 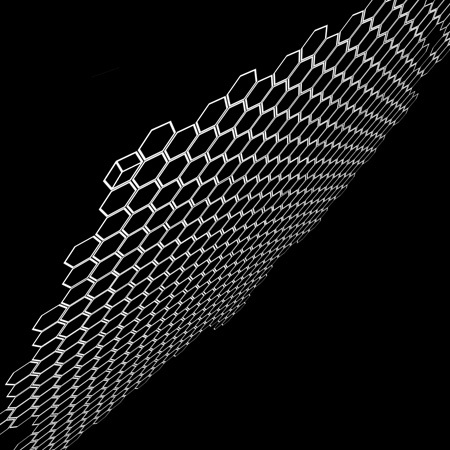 There are different ambient fluctuations here – from constant droning, as in “Hive (Part 1)”, tidal swells, as in the next piece, through irregular forms of the third part of “Hive”, to monumental and mixed structure of “Descent”, a 24 minutes tracks, with its own development, parallel story lines and overall magic capture of the listener. For me personally, it was a real joy and psychic saturation to listen to this album – it is like to read a perfect book – you are sure to remember it again and again. So, make a descent into the soft noise Hive of Akumu’s imagination. This entry was posted in Uncategorized and tagged Akumu, drone, No Type/Panospia, soft noise. Bookmark the permalink.